The diamond has been cherished for centuries for its timeless elegance and classic beauty. Selecting a diamond is both fun and important. At Elebash’s, we guide our customers through the diamond buying process in a friendly, relaxed atmosphere, allowing the customer to make an informed and confident decision. Below, you’ll find a simple introduction to diamonds. To better understand how diamonds are graded and characterized, we encourage you to stop by our store to see, feel and examine the gems for yourself. Elebash’s has a wide inventory of loose diamonds in every price range and four Registered Jewelers on staff ready to assist you in finding the perfect diamond for your special occasion. Over time, certain guidelines have been established to help determine a quality diamond – the four C’s: Cut, Color, Clarity, and Carat Weight. The four C’s work together in determining what makes a diamond beautiful. Cut is the most important determinant of a diamond’s beauty, and the only element directly affected by human skill and expertise. 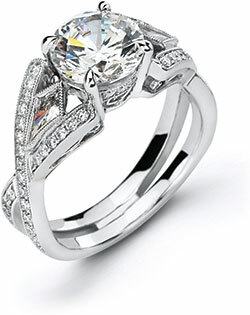 More than any other quality, cut determines the fire and brilliance of a diamond. Although diamonds are available in a number of different shapes – round, emerald, princess, pear, cushion, heart, radiant, asscher, oval and marquise – a well-cut diamond will internally reflect light from one mirror-facet to another and disperse and reflect it through the top of the stone. If a diamond is cut too deep or too shallow, the light is lost through the sides or bottom of the gem, resulting in less brilliance. A diamond’s true color is determined by viewing it from its side under balanced white light. Diamonds can range from colorless, which are extremely rare, to a light yellow, brown or gray color. Natural blue or pink diamonds exist, but are extremely rare. Most diamonds appear white or clear to the naked eye; however, when closely examined, most display a barely noticeable tint of color. Looking at different diamonds next to each other will help you get a better idea of the differences. One of our jewelers will gladly assist you in this process. Most diamonds have naturally identifying characteristics sometimes referred to as inclusions. Some of these characteristics include lines, crystals and feathers, which developed in the diamond during its formation. Many inclusions are not detectable by the naked eye, but can be seen under a jewelers magnifying microscope. Diamonds are “clarity graded” by taking into consideration the size, nature, location, color, and number of the inclusions. The fewer the inclusions, the greater the value of the diamond. The weight of a diamond is expressed in carats. One carat is equivalent to 200 milligrams. One carat can also be divided into 100 “points” so that a .75 carat is the same as 75 points or 3/4 carat. As diamonds increase in size, their price per carat increases as well. Remember, however, it’s not just a diamond’s carat weight or size that makes it valuable. All of the four C’s – cut, color, clarity, and carat weight – work together to create beautiful diamonds. Elebash’s provides its customers with perhaps the most important “C” of all – Confidence. Our jewelers carefully inspect every diamond before presenting it in our store. Elebash’s is pleased to offer its customers diamond certifications from the American Gem Society and the Gemological Institute of America – the two most trusted and respected independent gem labs in the country. Elebash’s has been a member of the American Gem Society for over 60 years, and its four Registered Jewelers have over 100 years of combined experience. The expert jewelers at Elebash's can create a unique piece for your big day or any special occasion. Learn more.